Here’s my recipe for day three of British Tomato Week. Enjoy. 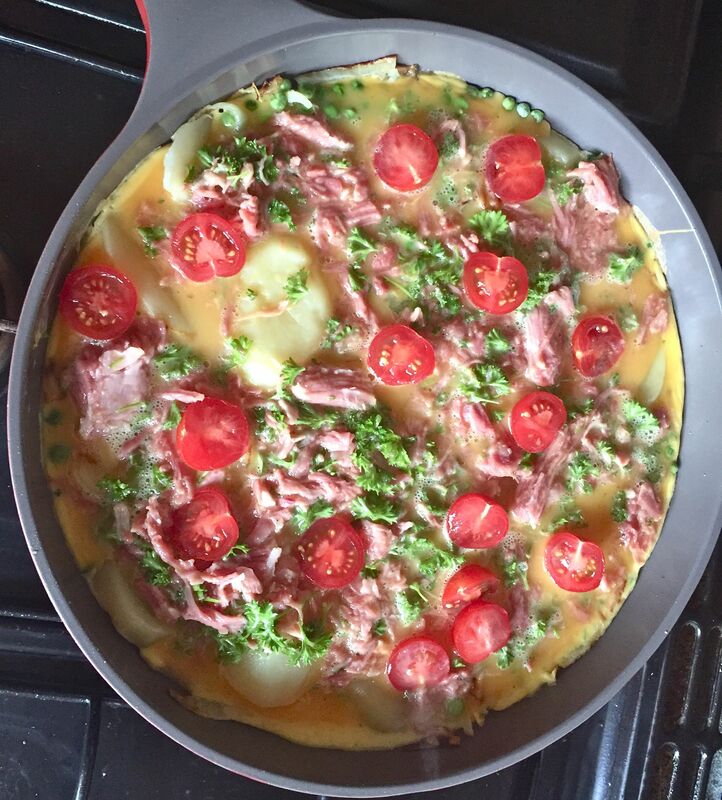 I love a Spanish omelette (tortilla). 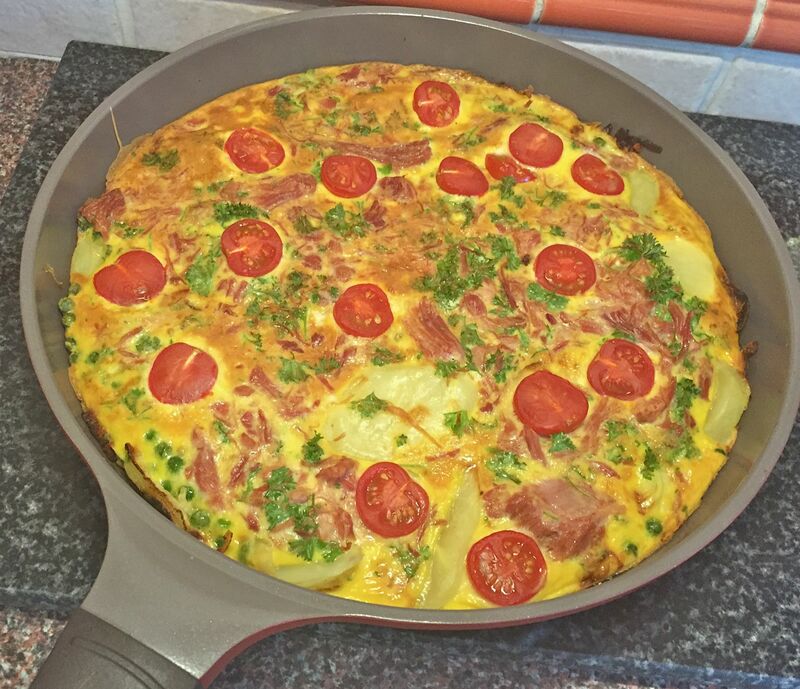 The fabulous potato, egg and onion base lends itself to endless additions, it’s the perfect dish to get creative with. This one has plenty of stuff in it, so will make a substantial meal and it’s topped with halved cherry tomatoes, making it look bright and beautiful. 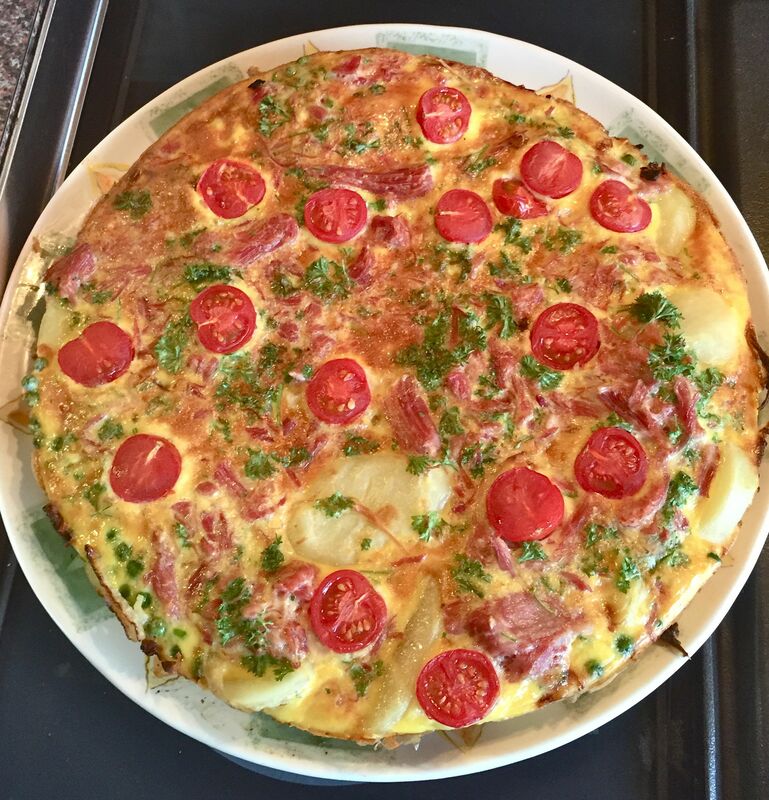 Tortilla is a wonderfully portable snack and tastes great cold and hot, so make a big one and you’ll have plenty of delicious leftovers to savour. Bring a large pan of water to the boil, add the potatoes and return to the boil. Simmer for about 5 mins until the potatoes are starting to soften. Drain and set aside. Heat 2 tbsps of the oil in a 25cm non-stick frying pan, add the onion and cook for 5 mins. Add the garlic and cook for another 3-4 mins until the onion is soft. Add the potatoes and peas and fry, stirring gently for about another 10 mins. Meantime beat the eggs in a large bowl. Add the parsley and ham and mix through. Pour the egg mixture into the other ingredients in the frying pan. Make sure it is spread out evenly. Dot the halved tomatoes evenly on top. Cook on the hob on a low heat for 10-15 mins until the base is set. Meantime preheat the grill and place the pan under it. Continue cooking until the top is set and golden brown. Run a knife around the edge of the pan and gently tip the tortilla onto a plate.